This has been a truly amazing phenomenon to witness (screenshots here HERE, Theory’s Wikitecture protocol HERE). Through the revisions, additions and edits of at least 11 different contributors and several phases of schematic evolution, it seems to have found a kind of singular life and identity of its own. It is clearly unlike what any one of the contributors would have designed on their own. It is sophisticated in its response to site cues, and nearly all of the main program elements have already been successfully achieved. The design has a clear sense of hierarchy and order – and all in the first 10 days of development. Its an infant project with fantastic and far reaching potential for the architectural profession. 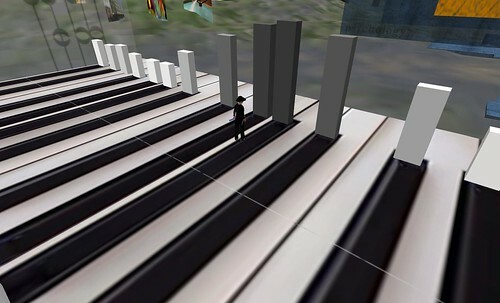 In imagining these possibilities, I can’t help but to wonder… what if Wikitecture works? 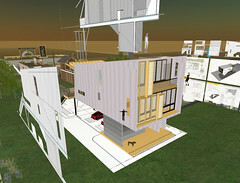 As a contribution to Architecture for Humanity’s Open Architecture Network, I built this virtual model on Architecture Island (SLurl). 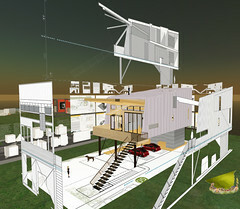 Real-life construction of the Porchdog home is part of Architecture for Humanity‘s effort to provide housing relief and redevelopment in post-Katrina Biloxi, Mississippi. Given the open and collaborative nature of this initiative, I think Second Life provides a perfect platform for visualizing, co-designing and brainstorming future contributions to the Network. Perhaps architects and designers from all around the world could gather virtually and collaborate on real-time relief solutions in the wake of an unforeseen disaster. In reading some of the descriptive principles of Open Architecture Network, I think it’s clear that these goals can be readily fulfilled through virtual collaboration. 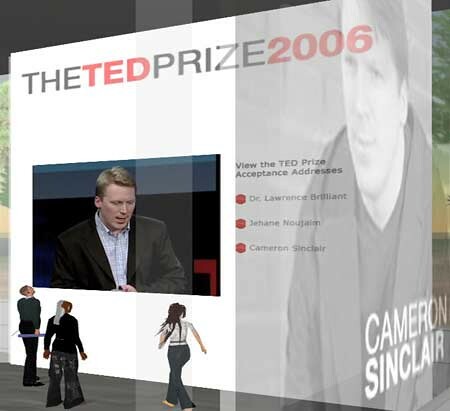 It’s about visualization, collaboration and community; all of which are existing features of Second Life. I would love to see SL become a catalyst for virtual collaboration toward this end, and hope we can find a way the Architecture Group can help facilitate it. This machinima has already been posted to the Network, and can be seen at the bottom of THIS page. While I was at it, I posted our entry into the Cradle to Cradle design competition, seen HERE. Wikitecture 2.0: Designing the Architecture of Architectural Design Collaboration. Can Architects (or designers in general) design a building collectively? The ‘RL Architects in SL’ group would like your help in trying to answer this question. We will be conducting another more comprehensive ‘Wikitecture’ experiment over the next month to determine just how feasible a collaborative approach in design might be for the architectural profession. You do not have to have any experience in architecture to participate; the more diverse the better. The write-up: Wikitecture 2.0. I’ve also pasted it to a page on The Arch HERE.